Alright, folks, prepare yourselves for a rave (review, that is). While my last Tata Harper post might not seem to have happened so long ago, this particular post is actually a long time in the making. Since trying out a few trial sizes of Tata's line, my collection of her products has grown exponentially, to the point that it's taken over a fair amount of my skin care routine. And, you know what? My skin has never looked or felt better. There's a reason so many people swear by her natural products, they truly are just that good. So today I want to focus on two of my faves from the line, both products that really promise to bring some radiance to your winter skin care routine. Let's start with the Boosted Contouring Serum*, an ingredient packed formula that works to firm your face for a more youthful appearance. Now, I'm 24 so I really can't speak so much for its work with wrinkles, but I can attest to the fact that it really does smooth out your face for a healthy, radiant look. Specifically, I've really enjoyed using it around my eyes, the one area where I do have some fine lines. After about a month of daily use I've definitely noticed a difference, and I very much attribute that change to this guy. Overall, while it might be targeted to those looking to achieve anti-aging results, I've really been happy with how it works as an overall great serum. There are some wonderful ingredients, such as willow bark extract (a natural form of salicylic acid), lavender and mango seed butter, that make my skin feel great, and that's really all I could ask for from a serum. Next up is one of the newest launches from the brand, the stunning Concentrated Brightening Essence*. It seems like every brand has been trying their hand at essences recently, but this was the first completely natural offering I had seen. I've actually tried one essence in the past (specifically May Coop's Raw Sauce) and, while I was sure at first it was just a gimmick-y step to make the beauty industry more money, I was pleasantly surprised at how well it worked. For those that don't know, an essence is a great step to add in between toning and a serum - its purpose is to help your skin better absorb the serum, and really soak in all the benefits. 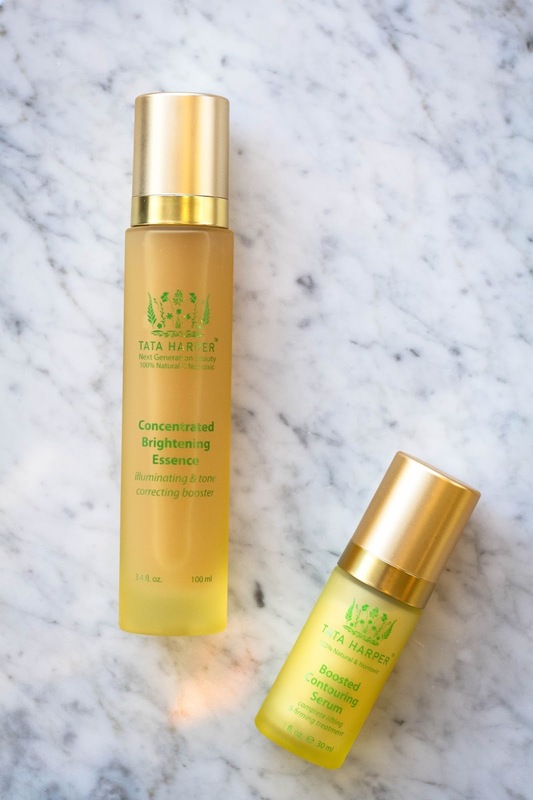 Tata's Concentrated Brightening Essence* is just that - a lightweight yet hydrating formula that perfectly preps the skin for a serum, using completely natural ingredients. This particular essence goes above and beyond, though, and actually adds in a brightening component, a claim I can very much attest to after a solid month of daily use. The formula is infused with sixteen high performing ingredients, including Alpha and Beta Hydroxy technology for a visibly toned, brightened complexion. My sensitive skin was never irritated by this, but instead has become far more even, brightened and radiant while I've been using this. It takes the tiniest amount, just one pump to cover my entire face, but it helps my serums absorb quicker and really does add an extra boost of hydration. I have been beyond impressed with this dreamy product, and honestly would recommend it to anyone looking to add a bit of luminosity to their skin this winter. Have you guys tried anything from Tata Harper? I'd love to hear some favorites!